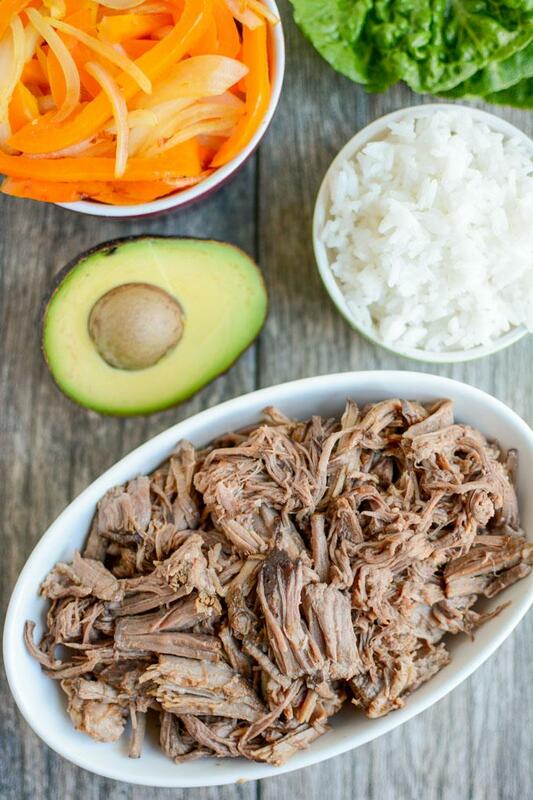 This Slow Cooker Shredded Beef is easy to make in the crockpot for dinner and tastes better than the Barbacoa at Chipotle. Perfect in burrito bowls, on salads, in enchiladas and more. Allow me to introduce this Slow Cooker Shredded Beef. You might also know it as barbacoa if you get it at Chipotle or other restaurants. You guys have been asking for more slow cooker recipes so today I decided to revisit an old recipe that my friend Marisa shared as a guest post several years ago. Back when she shared this recipe, I was super excited about it…but I never actually made it myself. A couple weeks ago I decided to change that! 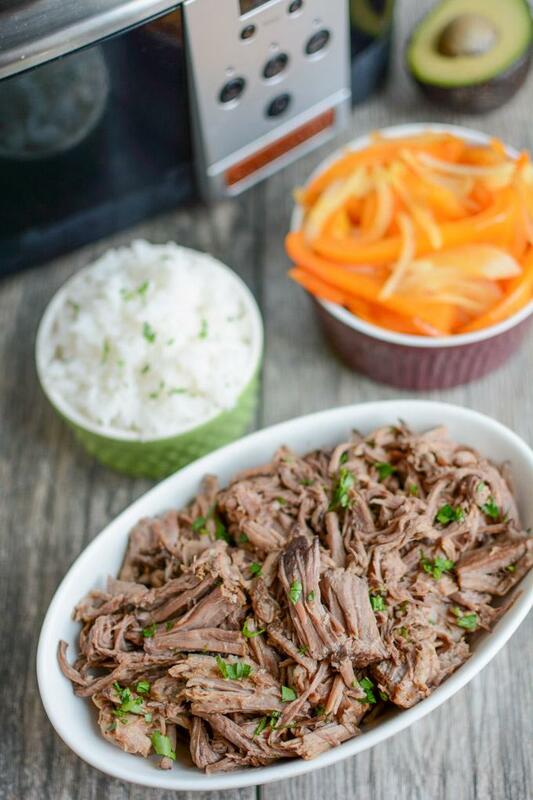 Whenever I make shredded meat at home, I tend to use pork or chicken…but hubby is a big beef fan and this recipe has some seasonings that I don’t typically use so I was excited to test it out. What I was not excited about was the fact that when I strategically went to the grocery store while I only had one kid, they didn’t have the cut of beef I needed. So then I had to go to a second grocery store after I picked up kid #2…which made it even more work. Nevertheless, we prevailed and came home with what we needed. This sauce does require a food processor or blender, which is one extra step, but I think it’s totally worth the effort. It’s super easy to throw everything in and it added such great flavor to the meat. I love having a big batch of shredded meat on hand that I can then use throughout the week to make various dishes like burrito bowls, nachos, taco salads, enchiladas, sandwich wraps and more. Adding the peppers does give it a bit of zing so I didn’t give this batch to the kids but hubby and I are big fans of spicy food so we loved it! You can reduce the number of peppers you use to make it less spicy. And if you have extra peppers in your can like I did, I just froze mine in a ziploc bag to use in the future! 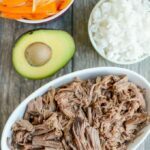 This Slow Cooker Shredded Beef is easy to make in the crockpot for dinner and tastes better than the Barbacoa at Chipotle. In a food processor or blender, combine the 3 chipotle peppers (removed from the can with some adobo sauce), cilantro, onion, garlic, cumin, oregano, salt, the juice of one lime, and the apple cider vinegar. Blend until almost smooth. Pour the homemade sauce on top. Add two cups of water. There you have it! Simple and delicious. If you’re not familiar with Marisa’s blog, Uproot Kitchen, be sure to go check it out! She shares great recipes like Whole Wheat Banana Bread, Peanut Butter Chocolate Chip Granola Bars and Slow Cooker Short Rib Ragu with Polenta. looks delicious! crockpot meals are the best! This looks fab! Love crock pot meals! Is there anything else I could use instead of chipotle peppers in Adobo sauce as we don’t have this in the UK! Hi Jen! If you can find dried chipotle chiles, or dried chipotle chile powder, there are plenty of recipes to make them in adobo sauce online using onion, apple cider vinegar, garlic, and ketchup. If you have any resources to find Hispanic foods online, you might be able to order them too. I keep the extras in the freezer since they come in a can with several chipotles – one can would last you awhile if you can get your hands on it! And yes, to the pasta. Harry and I have gotten into the horrible habit of ordering out when we’re too exhausted from our day. The problem being that we don’t have things that are quick on-hand! This sounds delicious and definitely something I can see my hubby taking to work for leftovers for a week. Oh my goodness! The Chipolte Barbacoa is my favorite! Although I try not to eat much meat lately I can see my family devouring this– and so easy. My daughter and I are huge fans of shredded anything, and it’s my go-to easy once a week slow cooked meal. I can’t wait to try this recipe for next time! Thanks again Lindsay for having me on your blog! I am so glad to hear that others have the same frustrations with coming home late at the end of the day without anything to eat, and the slow cooker can be such a useful tool. Looks good! I really need to use my crock pot more. Shredded beef reminds me a lot of Texas (where we previously lived). I could def go for some of this right now. I love the ingredients in this recipe. I’ve made something similar with chicken (I’m not a red meat eater), but I love a few of the additions here like apple cider vinegar and chipotle in adobo. I have to admit that Chipotle is my favorite restaurant. As soon as I saw barbacoa it made me think of Chipotle. This does sound pretty good. I’m a Chipotle addict. I have been since the very first time I ate there. I cannot wait to make this for my family this weekend! I love that this can be used on top of salads or rolled up into tacos. Will please everyone. agreed. it would rock as leftovers! I am making this today!! The BF and I are saving money and chipotle Sunday’s was our thing! Looking forward to see how long this lasts and how much we save! Who doesn’t love a little Chipotle?! This looks so delicious!! I made this in my Instant Pot with a chuck roast; 30 mins at High Pressure, quick release. Turned out wonderful!